2013 : Reflecting on a year as a Travel Writer! ~ The Wandering Soul's Wander Tales..
2013 : Reflecting on a year as a Travel Writer! I’ve said this before and I say it again, that I do not consider myself a writer at all. I consider myself an explorer and a decent photographer. And I started my blog with the sole aim of documenting my travels, not to become a better writer but as it turns out bigger things were planned for me. 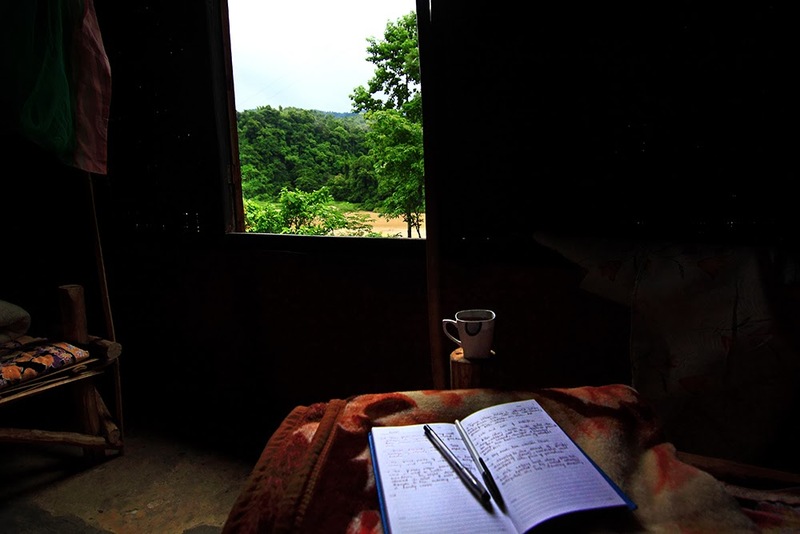 Taking notes in my little hut and sipping hot tea as it rains heavily. Somewhere in the jungles of Meghalaya. It’s been exactly a year since I started writing for National Geographic Traveller India. My first article appeared last year, this month - an article about my trek in the Thar Desert. When I saw the words “Text & Photographs by Neelima Vallangi”, I almost cried. It had been my dream for the longest time to work for NatGeo, I had no idea in what capacity though. I always associated NatGeo with exotic places, beautiful photographs and lots of wonderful stories and I wanted in on that. Sometime in September 2012, I decided I’d try my luck, by chance. In July 2012, I saw a lot of my photographer friends’ photographs being published in NatGeo Traveller’s first Indian Edition. I thought I should try getting my photos published too and I did get in touch with Ashima, the photo editor at that time. She liked my work and used some photographs for two stories on Western Ghats and Ladakh. I was getting photo requirement mails from few photo editors at different publications but the trouble was I never had photos from those places. They were mostly requests for photographs showing culture, heritage or images of well-known places, which were not part of my repertoire. It dawned on me that this way I’ll never have my photographs published. The kind of places I go to, no one will write about them. That’s when I decided I should probably try writing too and I sent my first pitch. Prior to this I had no fair idea on what I wanted to do in the travel space, I was sure I did not want to plan trips or do workshops. I might do workshops later on the side but only when I have established myself as a well-published writer or photographer. Somewhere between researching, pitching and writing those stories I realized that’s what I loved the most - story telling! I should’ve realized, often friends had told me I narrated the incidents in an interesting way. After coming back from a trip, there’s no stopping. I talk so much about a trip - how it made me feel, what I learned, what was amusing and everything else about it. My friends were the ones to face the wrath of my enthusiasm but I never thought much about why I enjoyed it so. No wonder I started a blog! I can’t do top-10 lists or hotel reviews or information pieces but I want to take people with me to some place outlandish. I was terrified to hit send on that first pitch and I assured myself the worst thing that could happen was only that I might not get a reply back from the editor. But I got a reply. I was shocked when my pitch was accepted; in fact I was shocked that I mustered up enough courage to send the first pitch at all with no previous publication credits to speak of. But that set the ball rolling. Working over the weekends, I’ve done 8 stories, big and small for NatGeo so far. Suddenly narratives, editing, hooks made sense to me. It was a whole new world and a big adventure learning all these new things. Later, I got requests to write for Greenpeace, Discover India, The New Indian Express etc and I wrote for them as well. Lesson learnt – It’s okay to dream big. In fact it is good to dream big. Like they say, even if we miss the stars, we’ll reach the moon! But writing doesn’t come naturally to me. I struggle and struggle. Half the times I stare at the blank screen, the other half of time is spent scouring the Internet for useless things in the name of research. But finally when I get the words out, in a weird way I feel ecstatic, that I created something! Of course the shock came at the end of the year when a company wrote to me saying I should write a book and they’ll help me publish it. Now that’s an idea, I had never considered writing a book and never considered myself to be that good but few people out there seem to think I can write. It’s comforting to know that I have come to this stage, this means I have grown. It was a long painful path but I certainly can see the change. I have not arrived as a writer and far from arriving but I do intend to keep at it. So that was my very interesting 2013! I traveled very less. I went on quite a few sponsored trips as a travel blogger but 2013 will be remembered as the year that gave a direction to my wanderlust. I started from scratch and am happy with where I am today. In 2014, I want to write more, read even more but most of all, I want to tell lots of good stories – visually and literally! Cannot agree more here! When it had to happen, it will! Wow ! Neelima I did not know you wrote for Nat Geo. We have shared the same dream here, though I fare much worse when it comes to not being a writer. I have always loved your blog, your writeups and photos. Hope 2014 is much better than 2012 and 2013 ever were combined. I so agree with your statement that if we miss the stars, at least we'll touch the moon. When I started freelancing about a year ago, I didn't even know we had to pitch stories! But I kept at it, and slowly I learned the rules. I've still a long long way to go, especially as a travel writer, but I know I'll get there someday. Wish you a very happy new year, with loads of travels! Wish you a very happy year ahead! When I came to your blog, I was awed with the kind of travel you were doing, and this is some which I had believed was not really possible in India. Or you can say, this was what I was afraid of. But, now I think I should certainly try. Congratulations Neelima!! This is very inpiring to read.All the very best to you to progress further!! Congrats neelima.may the new year bring bigger achievements. Beautiful, your passions and your professions are combining. THAT is great! Of all the blogs that I follow, read and browse, I place yours amongst the best. And am sure 2014 will take you to the next league of writers. Good luck, Neelima. Keep travelling and narrate all those wonderful stories in your beautiful language! Humbled and thank you so much! your creativity at writing and photography go well hand in hand,I wish you go a long long way on both formats.I always look forward to your blogs and would hope to meet you in some adventure trip of yours. I always admire your photography and feel good to read your stories. Sometimes the biggest hurdle you come across is the finance because in India it is difficult to do odd jobs to sustain your travel, plus your family and society bindings..there is an inner satisfaction when your travel writing published somewhere, I can understand that, but to me, it is more uplifting when you travel and expand your horizon, never attached to a conventional living or a conformist mentality, you travel and with time you start realizing there is something very deep, something very sublime that needs to be addressed first before going for other things. Your article inspired and encouraged me to get hold of my pen and diary. I have done many off beat treks and travel with two kids in tow since they were the age of two, yet could never muster the courage or desire enough to write in a proper way. Hope this year brings more and more articles from you and I get pushed to the w'ill to write. You surely are my role model for blogging. Wishing you a travel filled year ahead! Usually to editors, you send story ideas not the stories itself. After acceptance, stories are written. That is pitching. btw, what does 'pitching a story' means? Thanks Seema, glad to know you enjoy going through my blog! travel + writing is just my dream when i complete certain responsibilities of my. thanks for sharing such a great article. It all happens and only happens when it comes as instinct all from heart, simple English and furred with honest acceptance. We alwaya say in Hindi , lost are not those who didnt reach a destination but those who never dared to leave home. 2014 Dec will like to see more....farther. Thanks Shashank, I'm glad I took that first step. Hoping 2014 will see me write more. Nice post ! I have just started writing and i should say you were definitely one of my inspirations !!! Have been following your blog even before I decided to quit job and become a full time traveller. It is a great collection of information and heartfelt words. Would love it if you can have a look and give us tips to conduct the blog. Enjoyed reading this post. I liked it well. Keep on writing. All the best. Hey Neelima after reading a post from you and any Indian it gives me a lot of motivation to work more on my website..BTW such a good read keep writing and inspiring us.